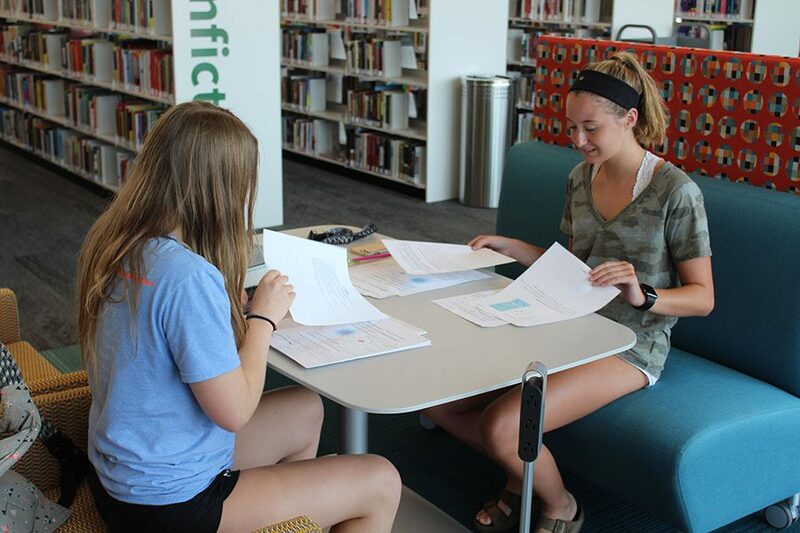 At the library on Sunday, Aug. 12, seniors Emily Proctor and Meredith Angelotti work on completing their AP Biology summer assignment. Within the sleek, modern walls and floor-to-ceiling glass windows of the Monticello Library, the entire community will find a welcoming atmosphere and plethora of features designed to accommodate their needs. According to sophomore Zachary Botkin, members of the community have been eagerly awaiting the library. “[The library had] a really great atmosphere with so many people excited for the opening,” Botkin said. Still, upon first inspection the Monticello Library may seem as nothing more than a fancy place to hold 90,000 books. However, the library has streamlined the process of obtaining a book via a touchscreen self-checkout, tablet catalogs, drive-up book drop and drive-through hold pick up, and also features a wide array of computers for personal use. These improvements haven’t gone unnoticed by the community, as sophomore Jordan White can attest. The library features lighter reads in their magazines, and both visual and auditory selections including 13,000 DVDs, 2,500 CDs and 21,000 audiobooks. For those not wanting to use the library’s technological or literary resources, one can instead look to its outdoor pavilion, numerous charging ports and vast variety of chairs and desks scattered across the library. Such features make spending time with friends, enjoying a snack from the library’s vending machines or studying an easy task for many in the community, including White. Beyond providing resources and services for the community, the library goes out of its way to ensure it accommodates everyone. It includes elevators as assistive technology for those in wheelchairs, a kids area with a storytime room and LGBTQ+ books are on full display and the statues outside adorn multilingual messages. According to branch manager Christian Madrigal, inclusion is key. Botkin said these improvements will allow the library to remain relevant by molding to the attendee’s needs.